WALLOPS ISLAND, Va. -- A successful NASA flight test Monday demonstrated how a spacecraft returning to Earth can use an inflatable heat shield to slow and protect itself as it enters the atmosphere at hypersonic speeds. The Inflatable Re-entry Vehicle Experiment, or IRVE, was vacuum-packed into a 15-inch diameter payload "shroud" and launched on a small sounding rocket from NASA's Wallops Flight Facility on Wallops Island, Va., at 8:52 a.m. EDT. The 10-foot diameter heat shield, made of several layers of silicone-coated industrial fabric, inflated with nitrogen to a mushroom shape in space several minutes after liftoff. 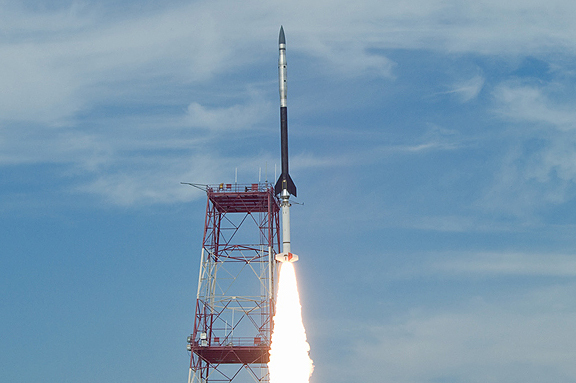 The Black Brant 9 rocket took approximately four minutes to lift the experiment to an altitude of 131 miles. Less than a minute later it was released from its cover and started inflating on schedule at 124 miles up. The inflation of the shield took less than 90 seconds. "Our inflation system, which is essentially a glorified scuba tank, worked flawlessly and so did the flexible aeroshell," said Neil Cheatwood, IRVE principal investigator and chief scientist for the Hypersonics Project at NASA's Langley Research Center in Hampton, Va. "We're really excited today because this is the first time anyone has successfully flown an inflatable reentry vehicle." According to the cameras and sensors on board, the heat shield expanded to its full size and went into a high-speed free fall. The key focus of the research came about six and a half minutes into the flight, at an altitude of about 50 miles, when the aeroshell re-entered Earth's atmosphere and experienced its peak heating and pressure measurements for a period of about 30 seconds. An on board telemetry system captured data from instruments during the test and broadcast the information to engineers on the ground in real time. The technology demonstrator splashed down and sank in the Atlantic Ocean about 90 miles east of Virginia's Wallops Island. "This was a small-scale demonstrator," said Mary Beth Wusk, IRVE project manager, based at Langley. "Now that we've proven the concept, we'd like to build more advanced aeroshells capable of handling higher heat rates." Inflatable heat shields hold promise for future planetary missions, according to researchers. To land more mass on Mars at higher surface elevations, for instance, mission planners need to maximize the drag area of the entry system. The larger the diameter of the aeroshell, the bigger the payload can be. The Inflatable Re-entry Vehicle Experiment is an example of how NASA is using its aeronautics expertise to support the development of future spacecraft. The Fundamental Aeronautics Program within NASA's Aeronautics Research Mission Directorate in Washington funded the flight experiment as part of its hypersonic research effort.